OK so we went fishing and then came home satisfied with our outing and the three little three inchers we caught. So what's waiting for us in our inbox the following morning??? yep this!!!!!! The in laws also decided that Monday was a great day to go out and see what they could hook, here's F-I-L with his little fishy!!!!! Amazing!!! It was great to see because it's been a while since he's been out and caught something this big. Love it!!!! 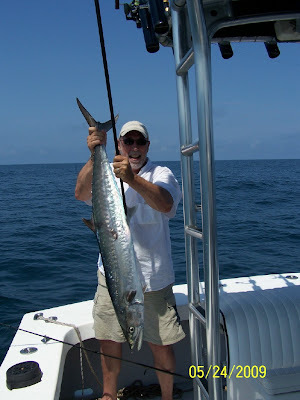 Can't wait to get down there this summer and get out and catch one myself, although I am a bit of a jinx I think, we never seem to do well when I am with them..... except this one time, I caught a barracuda... Urrgghhhhh!!!!! Ummm don't know, Steve mentioned the exact variety/species whatever you call it this morning but since I my interest is in the actual act and not the fish I didn't retain the information!!!! typical.